On a small side road off Tagensvej 83-85 is a well-preserved industrial plant from 1883-85. 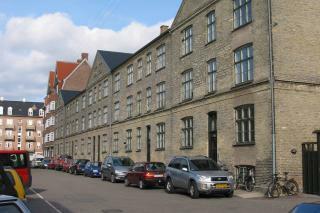 The factory is on the right, and the houses are on the left. The factory, Holger Petersens Fabrik, is a unique example of a planned attempt to create a household" with workers as family members and the factory owner at the top of the family hierarchy. The intention behind the houses and many communal facilities was to ensure a loyal workforce. It was also an effective way of rewarding the most productive manual workers and staff members. " If factory owner Holger Petersen had been alive today, people would think he was eccentric and old-fashioned. He was a right-wing man, in those days a Conservative. Petersen was a Member of Parliament. He not only built a decent and well-planned factory, he also established nearby housing for workers, kitchen gardens, a dining hall and a library. That was not only because it provided him with experienced and loyal employees. Holger Petersen was a man who thought he knew what was best for the men, women and children who worked for him. He was therefore the best person to ensure that their living conditions were in order. This ideology was in sharp contrast to the popular ideologies of the time. Socialism and Liberalism promoted the role of the state and the individual, respectively, in terms of responsibility and won in the long run.